No fooling, it was like the first day of summer. Our “brick and mortar” store is located at Harbourfront in Toronto Canada. The sun is staying higher in the sky much later in the day now (ie past mid afternoon). It is still cold. The American Sail Training Association‘s annual conference is being held this week in Toronto, just around the corner from our “brick and mortar” storefront. We welcome the delegates to town and hope they have a productive and enjoyable conference. We’ll look forward to seeing you again this summer at the Toronto Waterfront Festival. For ASTA tall ship spotters, Thad Koza’s Tall Ships is a great reference to member vessels and organisations. The loss of the Concordia in February was a deeply saddening disaster, redeemed by the survival of the entire crew. It is remarkable both that a modern tall ship was lost due to a knock down, and that despite the loss of the vessel, the entire crew survived. Their survival is a testament to the quality of the crew and the importance of safety drills. The findings of Transport Canada and other maritime bodies investigating the sinking will be greatly informative to safety-conscious mariners. In the mean time Tall Ships Down by Daniel S. Parrott, former skipper of the Pride of Baltimore II, is the definitive book on tall ship safety and stability. It is highly recommended reading for anyone interested in the mechanics of nautical disasters and how to prevent them. The Handbook of Survival at Sea is another excellent book, now discounted, detailing methods and strategies on survival once a disaster has occurred. Our “brick and mortar” store is located at Harbourfront in Toronto Canada. The sky, water, and city this time of year can best be characterised as “grey”. Not Pictured: The tropical paradise of Belize where increasing numbers of our local customers are headed. For over thirty years, Lin and Larry Pardey have been sailing around the world, writing about their adventures, and showing others how to follow them. Unlike most modern cruisers they sail without any engine whatsoever! The third edition of their cruising classic, The Capable Cruiser has just come out. It’s fully revised and updated, and has nine all new chapters including: ways to encourage your partner to share your dream; strategies for turning sudden engine failure into a minor incident; choosing safety equipment; repairing rigging at sea; and and “What do people worry about that never actually happens”. Another exciting boat show is behind us! The Toronto International Boat Show ran between January 9th and 17th and was as fun and action packed as any! The boat show always provides such a great opportunity to catch up with old friends, meet interesting customers from far afield, and check out the latest in boat fashion and tech. This year was no exception as we were joined by some of our favourite authors and sailors. Among others, Ann Vanderhoof, Paul and Sheryl Shard, and Liza Copeland all spent some time at our booth. Ann shared tasty recipes from the Caribbean and autographed copies of her new book, The Spice Necklace. Ann’s previous book, An Embarrassment of Mangoes, is one of our all-time bestsellers. Paul and Sheryl Shard, were reeling with the joy of having just purchased a new boat and gave seminars based on their popular Distant Shores series. Finally, Liza Copeland stopped by to talk about her excellent Just Cruising series of books. Our selection of books for professional mariners is both massive and massively popular. Some of the books are massive themselves — Bowdich’s American Practical Navigator weighs in at 879 pages, 30 x 23 x 6cm, and almost 3Kg — so mariners looking for reference texts but not ballast will be interested in the shift towards digital books. The IMO is also innovating their distribution and pricing models. Each of these titles is available on free (FREE!) CD-ROMs as a “demo”. Once you’ve decided the book a) Works on your computer; b) Is what you’re looking for; & c) Requires purchase for further use, we can get you an activation code. There’s a 50% discount on additional copies (beyond the first one) when ordering two or more activation codes. It’s all relatively new and exciting. Let us know if you have any questions. Of course we’ve still got a full selection of IMO books in paper format. And many more. They’re all in our Bargains section. 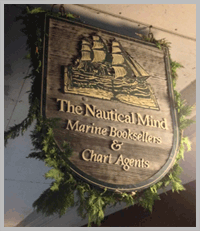 Yes, hello, and welcome to The Nautical Mind Bookstore’s new blog! We’ll use this space to keep in touch with you: boaters, readers, and customers everywhere. We’ll keep you up to date on interesting new books, inform you of our latest bargains, and talk about developments in the boating community. You’ll be able to ask questions, gam with other sailors, tell us what we’re doing right, and let us know where we can improve. Pictured left is our store front. We’re not just a great website that offers an unparalled selection of boat books, cheap and fast shipping, and courteous service, we’ve also got an actual store, staffed by experienced sailors who’d be happy to swap stories the next time you’re in the neighbourhood.